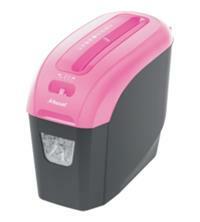 This stylish, bright Rexel Joy Cross-Cut Shredder (Pretty Pink) will help bring some fun and colour into any house, home office or school - and also help keep you or your organisation protected from identity theft and fraud. The shredder can shred up to 6 sheets of 70gsm paper at a time (or 5 sheets of 80gsm) and shreds paper into cross-cut pieces measuring 4mm x 40mm. This gives it a P-4 security rating, suitable for shredding highly confidential material. The shredder has a 7.5 litre bin which can hold up to 50 shredded sheets of paper and it’s easy to empty - you simply lift-off the bin head. In addition, there is a handy viewing window so you can see when it’s getting too full. As well as paper, this shredder will also handle staples and paperclips - and you can put credit cards through it too, handy if you want to safely dispose of old expired bank cards for example. Noise level for the Rexel Joy is 73 dBA, making it a quiet choice for shredding, especially if you are in a shared environment.